At the heart of Wariki’s performances is the re-creation of traditional art forms into theatrical productions. However, though we describe certain arts as traditional today, they have not always had such a tangible form. They are born of the underlying hopes and beliefs of our ancestors and are the culmination of generations of refinement. Disciplines are passed on from person to person and refined through criticism and even competition. Through this process, slowly the unnecessary and unreasonable elements of the original form are stripped away leaving what we call tradition. The ascension of tradition involves the transmission of experience and technique, posing the question, “How was this effectively utilized in the past?” then asking of the next generation, “How will you put this to use?” and finally challenging us to ask, “What will we create now?” Wariki is not a fixed membership organization. Wariki is the name given to that space and time in which artists who create their own realities, seeking out those forms that they cannot create alone, can come to produce new ideas and possibilities embracing the mutual influence of like-minded artists. Akira Katogi was born in Akita Prefecture. From childhood he learned a variety of traditional arts including nihon-buyo, kagura (folk dance and ritual dance dedicated to Shinto dieties), and ohayashi (festival music) from across Japan. Dedicated to the ideal that, “Stage productions are today’s places of ritual and celebration,” Katogi continues to evoke a warm reminiscence of hometown roots, prayers for happiness, and heartfelt hope in his theatre productions. 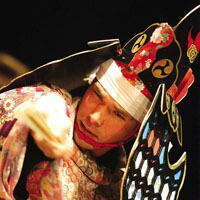 Katogi’s performances have enchanted audiences both in Japan and around the world. In 2002, he was invited to Paris to perform at the Christian Dior Haute Couture Fashion Show, and in 2013 he toured the United States and Canada to great acclaim. Shunsuke Kimura is an acclaimed performer of Japanese flute and tsugaru-shamisen as well as an accomplished composer and musical director. In his collaborative work with performances of the koto and violin entitled “Insho,” Kimura presented a unique world of internal and natural beauty. Kimura has performed in more than 30 countries around the world and is renowned for his use and celebration of rhythms and modes found in the folk music of Japan. He has been featured on major world music media, such as BBC3 in England and WDR3 in Germany. Etsuro Ono studied tsugaru-shamisen under the late master Chisato Yamada in Hirosaki, Aomori Prefecture. He joined the traditional Japanese dance theatre ensemble “Warabi-za” in 1990, performing shamisen as a member of the renowned troupe on numerous stages in and outside of the country. In 2003, he left to begin his career as an independent artist and while remaining centered in his traditional roots, he took this opportunity to compose and arrange new works later releasing his first album, “Nine legends” in June of 2014. 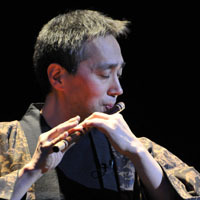 Beyond his solo work, in May of 2006, Ono released the album “Hanzo”, which was a collaborative work with performances of taiko and shakuhachi. Ono joined forces with Kimura Shunsuke to form “DUO”, a collaborative project that performs internationally including a European tour in July of 2012 and May of 2013. Kuniko Obina’s study of the koto began at an early age from her mother when she was three years old, and later included the Sangen from the age of ten. She received her masters from the School of Japanese Traditional Music at Tokyo University of the Arts. She completed the NHK Training Course for Japanese Traditional Music Specialists and went on to pass the NHK audition for Japanese Traditional Music. Her first CD “Edo Komachi” was recorded as the number one selling album in Japanese traditional music. Obina is actively involved in concerts and recording, as well as being featured on TV and radio programs including appearing on “The Untitled Concert”. She toured Germany in October of 2006, and went on to perform across Vietnam and the Philippines in July of 2012 in a production entitled, “AKI & KUNIKO”, which was sponsored by the Japan Foundation. During childhood, Shingo Ikegami learned Koto from his parents and continued his studies under Makiko Saito and Katsuko Uchida. He Graduated from the School of Japanese Traditional Music at Tokyo University of the Arts in 1989, and went on to pass the NHK audition for Japanese Traditional Music in 1993. Amongst performances throughout Asia, Ikegami’s international performances include such prestigious concerts and venues as a collaboration with the Miyagi Koto Company in Hawaii (1991), participating in the delegacy tour of Turkey on behalf of the Agency of Cultural Affairs (1994), performing for Tokyo Inter Arts in Hanover and Berlin (1996) and Tokyo Inter Arts in Sydney (1997), and participating in the Japan-China Friendship “Koto” Concert (2000). He has been teaching koto at the School of Koto Music, Joshibi University of Art and Design since 1995. Frequently making appearances on TV and radio, his recorded works include the albums: “Sangenjaya” (1994, Bamboo Records), “OCTET” (1995, Bamboo Records), “Gozoroppu” (1998, Bamboo Records). Shingo founded the koto school “Makinokai,” and is actively performing, composing, and arranging traditional Japanese music. He is also a writer and lecturer on the subject of music, and frequently has adjudicated musical competitions. He has written and published many works performed by musicians from all over Japan. Imafuku joined the wadaiko performance group “Ondekoza” when he was 24 years old, and performed on numerous tours across Holland, Spain, France, and Japan. After a seven year hiatus from performing, he acquired a series of drums including an O-daiko (almost 1 meter in diameter), and started his career as a solo performer. His international performances include “The 1st International Drum Festival” in South Korea and performances in Indonesia, Cuba and the Dominican Republic. Imafuku continues to perform throughout Japan, including performances at the “Japanese Taiko Festival” at Osaka Castle Hall, and “Yu Imafuku’s World” in Tokyo as well as in school concerts throughout Japan. In 1991, Tetsuro Naito joined the internationally renowned wadaiko group “KODO,” which is based in Sado, Niigata. He has received high acclaim for his work as a performer, composer, and director. He left KODO in 2002 to pursue a career as a solo artist. 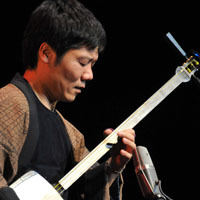 With a high level of skill and unique sense of musicianship, Naito’s career has included performances, recordings, and tours that are unrestrained by genre and include collaborations with a wide range of artists such as Toshiki Kadomatsu, DJ Krush, Soul Flower Union and Yoshida Brothers, and a host of other talented musicians. Tetsuro continues to break new ground for taiko music, pursuing the power and possibilities of musical expression that can be conveyed by this quintessentially primal instrument.